With a view to encourage and stimulate advanced economic research in international economics, trade, development, and related financing at universities and academic institutions in India and abroad, the Export-Import Bank of India has instituted two international awards viz. the International Economic Research Annual (IERA) Award and the BRICS Economic Research Annual Award (BRICS Award). These initiatives represent the Bank’s ongoing efforts at promoting economic research and analysis, thereby contributing to policy formulation. For further information about the Award, please contact us at rag@eximbankindia.in or T: +91-22-2217 2701/ 2708. Presentation of Exim Bank of India’s BRICS Economic Research Award 2018 by Mr. Frans Baleni, Deputy Chairman, Development Bank of Southern Africa, to the Award winner, Dr. Zheli He in the presence of Mr. David Rasquinha, Managing Director, Export-Import Bank of India and other top officials of the member development banks from BRICS, during the 8th Annual BRICS Financial Forum hosted by Development Bank of Southern Africa in Cape Town, South Africa on July 25, 2018. Exim Bank is the nominated member development bank under the BRICS Interbank Cooperation Mechanism, along with other nominated member development banks from member nations of BRICS namely Banco Nacional de DesenvolvimentoEconomico e Social (BNDES), Brazil; State Corporation Bank for Development and Foreign Economic Affairs (Vnesheconombank), Russia; China Development Bank Corporation (CDB), China, and Development Bank of Southern Africa (DBSA), South Africa. In the context of India’s Chairmanship of the BRICS Forum during 2016, and under Exim Bank’s Presidency of the BRICS Interbank Cooperation Mechanism, Exim Bank instituted the BRICS Economic Research Award in March 2016. 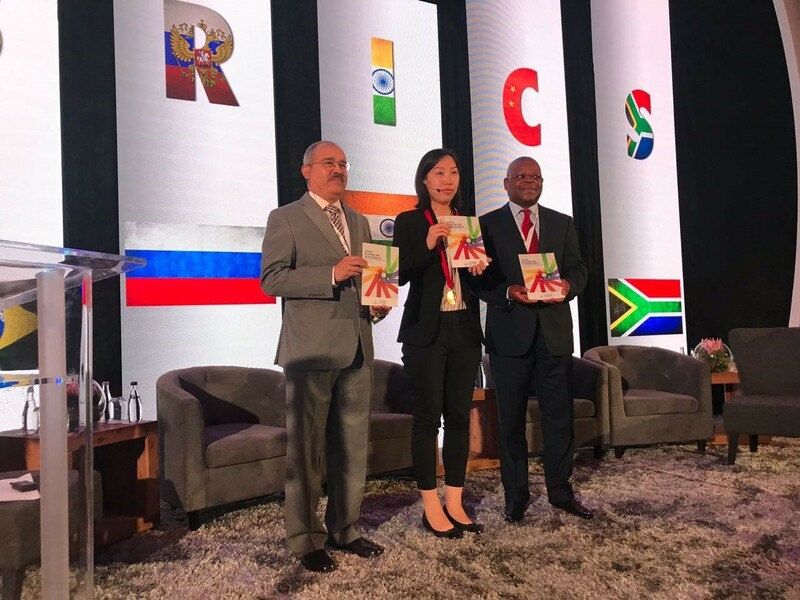 The BRICS Economic Research Award represents Exim Bank’s on-going efforts at promoting research in the area of international economics, trade, development and related financing. The objective of the Award is to stimulate and encourage advanced doctoral research on Economics and related topics of contemporary relevance to the member nations of BRICS. The Award comprises prize money of Indian Rupees 1.5 million (approximately USD 22,000) sponsored by Exim Bank, a medal and a citation. Doctoral thesis of nationals of any of the five member nations of BRICS, i.e. Brazil, Russia, India, China and South Africa, who have been awarded a Doctorate or accepted for the Award of a Doctorate from any recognized nationally accredited University or academic institution globally, are eligible to participate and receive the Award. The Award accepts as entries, doctoral thesis written by nationals of any of the five member nations of BRICS, who have been awarded a doctorate or accepted for award of a doctorate from any nationally accredited University or academic institution globally, during the period January 2014 to March 2019. The broad focus of the eligible theses could be International Economics, Trade, Development, and related aspects of Financing, which may also have particular relevance especially to BRICS nations/ member development banks of BRICS. The last date for receiving entries is April 15, 2019. The objective of the IERA Award is to stimulate advanced doctoral research by Indian nationals in international economics, trade, development, and related financing at universities and academic institutions in India and abroad. The Award consists of a prize amount of ₹ 3,50,000/- (Indian Rupees Three Hundred and Fifty Thousand only) and a citation. Presentation of Exim BankInternational Economic Research Annual (IERA) Award 2017 to Dr. Amrita Saha by Dr. T.C.A Anant, Head of Department, Department of Economics, Delhi School of Economics, University of Delhi (center), in presence of Mr. David Rasquinha, Managing Director, Export-Import Bank of India (extreme left) and Mr. T.C.A. Ranganathan former Chairman and Managing Director of Export-Import Bank of India (extreme right) at the Award Function held in New Delhi on August 09, 2018. 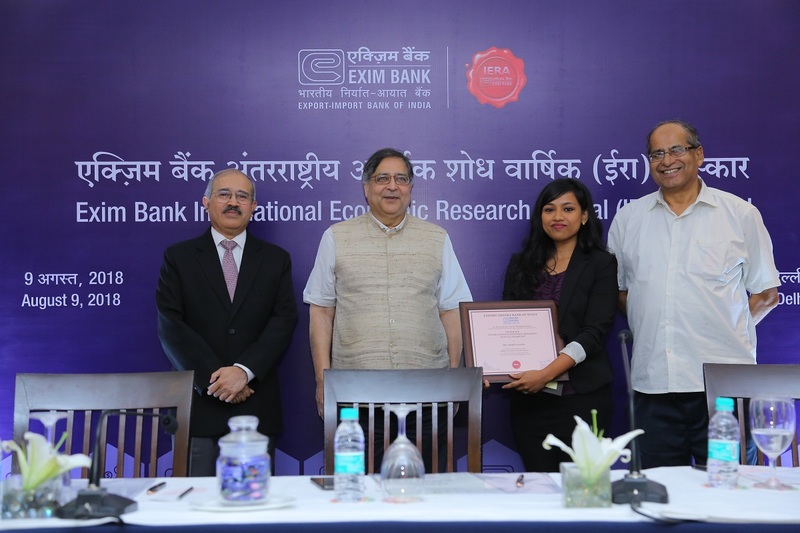 Exim Bank has instituted an annual Award for promoting doctoral research in international economics, trade, development and related financing. The objective of this Award is to promote research in international economics, trade, development and related financing by Indian nationals at universities and academic institutions in India and abroad. The Award consists of prize money of Indian Rupees Three Hundred and Fifty Thousand (₹ 3.5 Lakh) and a Citation. The Award was instituted in 1989. Dr. Brijesh Pazhayathodi: Exports of Services and Offshore Outsourcing: An Empirical Investigation in the Indian Context. Dr. Debkusum Das - Some Aspects of Productivity Growth and Trade in Indian Industry. Dr. C. Veeramani - Intra-Industry Trade under Economic Liberalisation: An Analysis of India Manufacturing Sector. Dr. Avik Chakrabarti - Foreign Direct Investment and Host Country Interaction: A Strategic Approach. Dr. Arijit Mukherjee - International Joint Ventures and Technology Transfers in Developing Economies: Theoretical Analyses. Dr. Rajat Acharyya - Theoretical Aspects of Liberal Trade Policies in Transitional Economies: Exchange Rate, Competition and Exports. Dr. Avadhoot Nadkarni - India's Exchange Rate under the Basket Arrangement: An Exposition and Evaluation. Dr. Laveesh Bhandari - International Technology Transfer: Contracts, Learnings and Alliances. Dr. Aditya Bhattacharjea - Essays in Industrial Organisation and Strategic Trade Policy for Developing Countries. Dr. A. Prasad - External Debt of Developing Countries: A case study of India. Dr. (Mrs.) Ashwini Deshpande - Some Aspects of International Debt of Developing Countries. Dr. Subhayu Bandopadhyay - Export Taxation in a Multicountry General Equilibrium Framework. Dr. (Ms.) Neelam Singh -Foreign Ownership, Size and Performance of a Firm: A Case Study of Indian Pharmaceutical Industry. Dr. Sebastian Morris - Foreign Direct Investments from India: 1964-83. Dr. Prabhirjit Sarkar - The Post War Terms of Trade Controversy: A Re-Examination.